Auric Goldfinger is smuggling vast amounts of gold throughout the world. MI6 agent, James Bond, is sent to investigate Goldfinger's master plan of conquering Fort Knox in the US and faces macabre adversaries like Oddjob. From the 1964 James Bond film Goldfinger, comes special agent James Bond, as portrayed by Sean Connery. 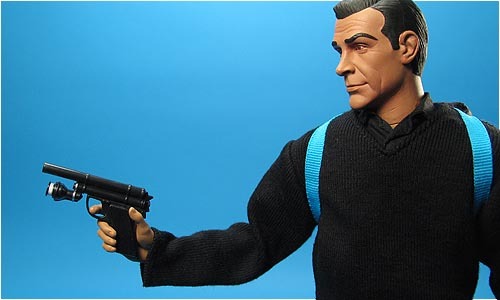 The 12" figure comes with Fort Knox gold bar, Walther PPK, Walther P38, tube of plastique, homer device and figure stand.